Metric Insights 5.3.0 represents a major shift in how Reports are designed, processed, and stored in our KPI Warehouse. Dataset Reports introduce an entirely new Drag-and-Drop user experience. Slack App makes Metric Insights content available in your internal conversations. Alert Simulation makes it possible to predict how often an Alert might be triggered based on historical data. Portal Pages allow the creation of custom-branded portals. 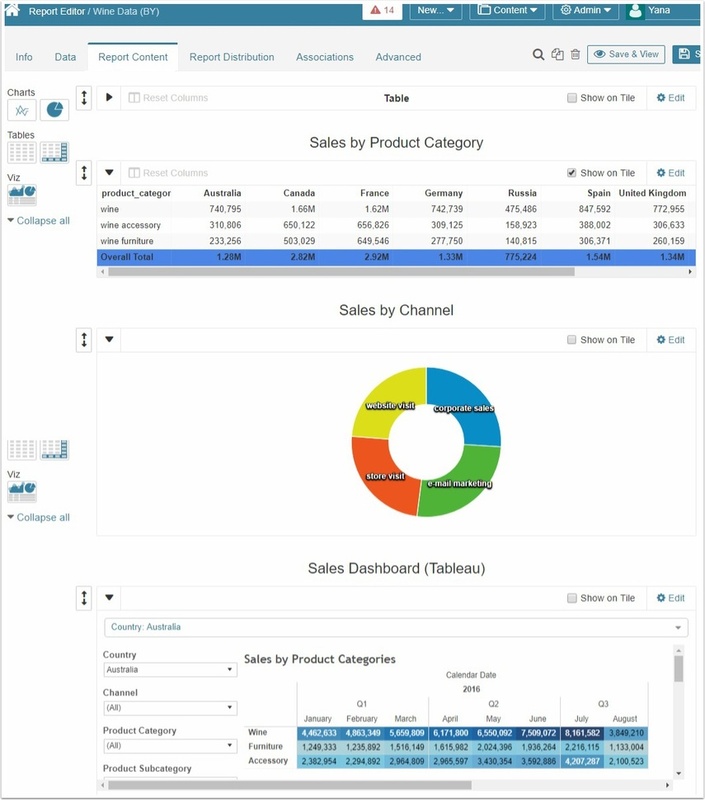 Dataset Reports feature a variety of new dynamic reporting capabilities. Report designers now have a tighter grasp on how the data in Dataset Reports is managed and displayed in the Editor, Viewer and in email distribution. In 5.3, Dataset Reports can be used alongside Legacy Reports. Once functional parity is achieved in a future version of Metric Insights, Dataset Reports will replace Legacy Reports. The new MI Slack App allows integration of your Metric Insights system and Slack. 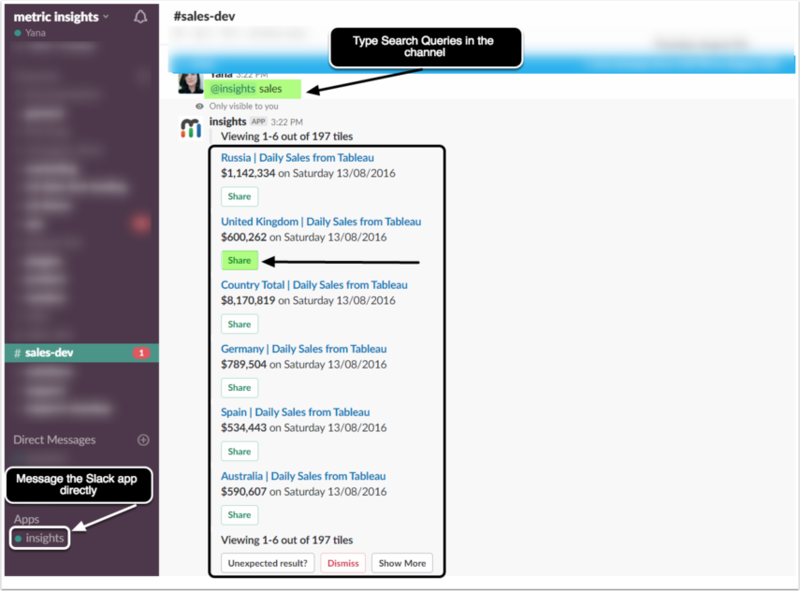 You can enter search queries in a Slack Channel and have the app deliver content to that Channel based on the matches found in Metric Insights, or interact directly with the Slack App. Once the MI Slack app is added to a Channel, content can be searched by Title, Tag and Dimension. Search queries can also be phrased as questions (e.g What are Daily Sales?) that will parsed by the MI Slack App. Queries can be typed in the Channel or via Direct Messaging an MI Slack App. The app will suggest possible matches. Provided the hits are relevant to your search, they can be shared to this or another Channel. [5.3.3] Interval-based search has been included in the scope of the Slack app functionality. [5.3.3] Fuzzy matches are now returned as suggestions. [5.3.3] Message with explanation of parsed results has been added as a reply to a search query. [5.3.2] Secure content display in a Slack Channel has been added. You can now specify the elements that will be shown in a Slack channel. [5.3.2] Signing secret for Slack app endpoint was implemented to verify that all requests come from a trusted server – the Slack Server. [5.3.2] Requests from Slack can now be routed via a Proxy Server while the main MI app remains securely locked. [5.3.3] A new Config Variable was added to allow 90-day image retention to prevent broken links to recent posts in a Slack Channel. 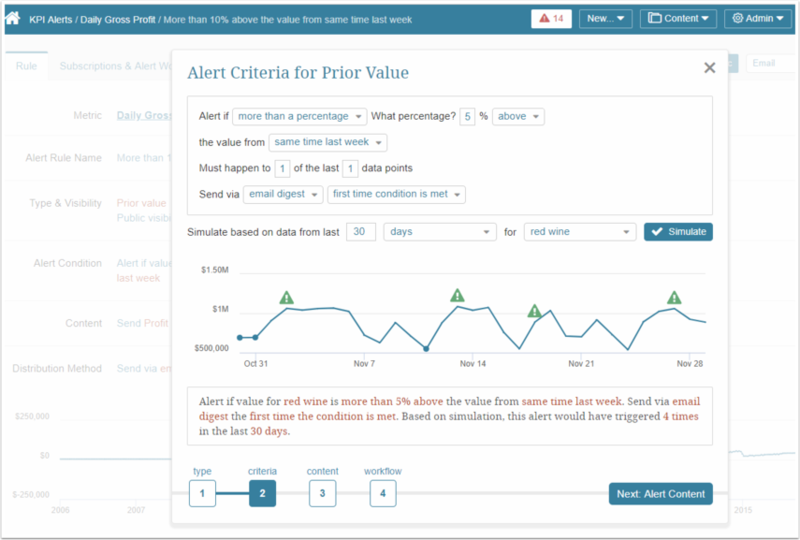 5.3 introduces Alert Simulation based on the Alert Rule that is created. Alert Simulation can be executed on Step 2 of the Alert Creation Wizard after all of the Alert Criteria have been defined. The simulation allows to see how many times an Alert would have triggered based on the current settings and adjust them if necessary to make sure that there neither too many notifications nor any of the important data points are missed. A new Measurement Interval, Life to Date, has been made available for Metrics and Reports. Data is collected continuously from the date that the element is enabled without regard for calendar or fiscal period boundaries. As of Version 5.3.1, content can be organized and distributed in a whole new way. 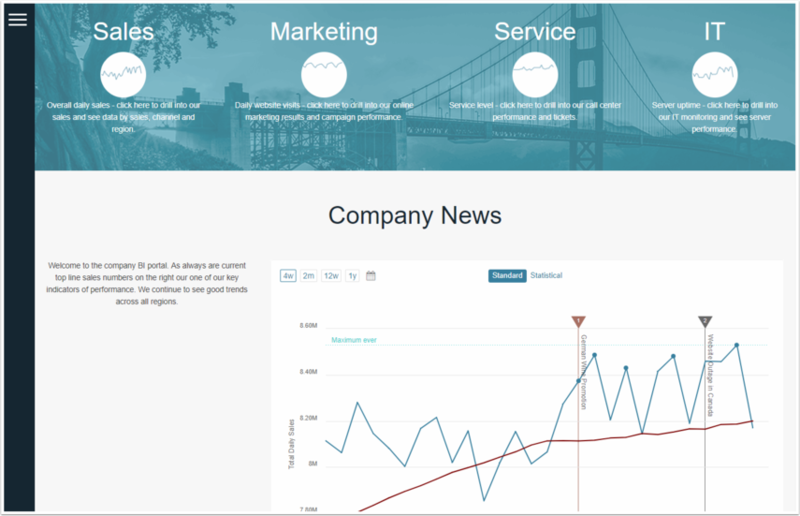 Portal Pages functionality will allow to customize User experience with Metric Insights by creating User-designed pages that feature highly relevant data. Metric Insights can serve as a framework where User-provided Layouts are embedded to create User-branded portals. The classic Metric Insights Homepage (the Catalog View) can be displayed alongside multiple tabs with Portal Pages that can easily be navigated between. [5.3.2] Portal Page access can now be defined at the User and Group level via their respective Editors. [5.3.2] We have introduced a CSS Editor—files can be edited directly in Metric Insights. Power Users may create, edit and assign access to Categories and Data Collection Triggers to which they have Edit Access. The ability to create Categories remains an implied Privilege of every Power User. There is a new Privilege to create Triggers. There are also two extended Security Privileges and be able to grant Category and Trigger access to all Groups and other users. To facilitate creation of these Groups, there are now standard Privileges that are are automatically granted to new All Access and Default Groups. Improvements have been made to ensure that a Power User has access to the Dimension's Configurable or Non-Configurable Data Source before it can be edited. The Content menu > Dimensions grid only contains those Dimensions to which the Power User has full Edit Access. [5.3.2] Instead of refreshing manually, you can now refresh the list of Objects for plugins (for example, Tableau, PowerBI) based on a Data Collection Trigger. [5.3.3] Google AdWords was moved to Java. [5.3.2] Splunk: Visual Editor was added. PowerBI: adjusted to speed up the "Refresh List" timing. Tableau: Visual Editor supports more than one Filter value in the queries. [5.3.3] Google AdWords: Token, Client ID and Client Secret were added to plugin connection profile. Google Play Console: added to a list of supported plug-ins. A major re-architecture of our Android app is in-progress, starting with the Homepage (in Analyst Insights mode). It is now much faster, with a native UI and many small enhancements. (Note: the new app requires 5.3.0 or higher server version). Our latest iOS app now supports Touch ID/Face ID for login as well as many other small enhancements and bug fixes. Contact support@metricinsights.com if you would like further details. [5.3.3] Broken Data Dependencies are now fixed automatically. [5.3.1] Pivots: Problem rendering Pivot Tables (only problem in old versions of Chrome). [5.3.1] If styling is chosen for a Target Type, it is not applied to a Metric line. [5.3.1] Microstrategy: PDF image is truncated in External Report. [5.3.3] There is a known issue with Power Users in terms of slow dimension access. We are optimizing the related queries. Athena JDBC Dataset validation no longer fails due to error parsing DataCollector JSON result. It is now possible to aggregate a Derived Field in the Dataset Viewer. [5.3.1] Child Dataset is now automatically synchronized with parent Dataset trigger update. [5.3.1] Pivots: Formatting rules "Less than" / "Less than or equal" are applied accurately. 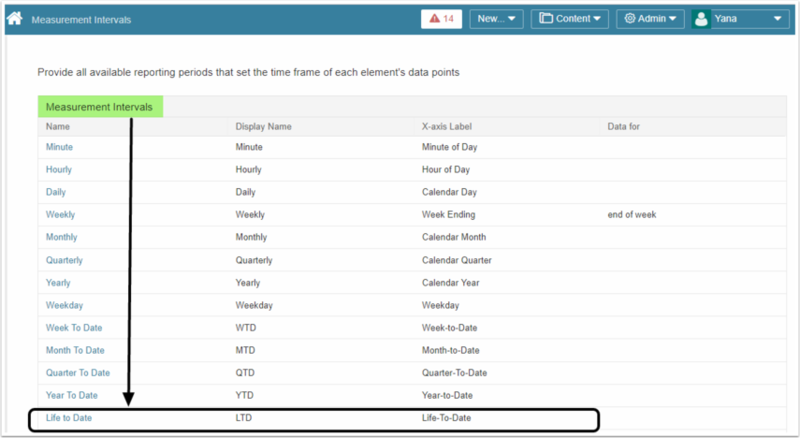 [5.3.1] Pivots: When changing display masks for Date Values, the Measurement Values are now displayed. [5.3.1] After changing Data Source for Report, External Visualization can now be created. [5.3.3] Row count is now displayed correctly on Tile. [5.3.3] Email: Text color is applied correctly to columns in tables with hyperlinks. "CSV:Raw" downloaded file now contains unformatted data as expected. SQL query to generate Alert Rule grid in a Metric was optimized. [5.3.3] Metric Overlay: Line Type is now applied to period that comes before Date without Data. [5.3.3] Portal pages are now enabled upon initial creation. "Test Connection" can now be passed for plug-ins with Remote Data Collector. Pivots: Grouping column in email is now aligned correctly. Immediate Alerts: "Send image with text message" option is now available. Digests: Send only what has been updated since last email' is now the default. [5.3.3] Bursts: Elements in a Burst are now displayed in the correct order. [5.3.3] Bursts: A Report is included automatically in a new Burst when the Burst is created from the Report Viewer. [5.3.3] Alerts number is now counted incorrectly. [5.3.2] Elements in Categories now behave more intelligently. If a Category exists in the target system, the element is placed in the same category as in the source system. If a Category does not exist, it will be created. After changing User Groups membership, access to Dimensioned Elements is now inherited properly. Salesforce: Report list collection is now successful. Elasticsearch: connectivity issue due to Lib conflict is resolved. [5.3.1] PowerBI: updated plugin has no longer trouble parsing certain data types. [5.3.1] PowerBI: Width/Height in External Report's requested image settings are now considered when sending request to Power BI data source for image collection. [5.3.3] Google AdWords: Columns in Visual Editor are now sorted. iOS: when adding/deleting comments on Alerts, Users no longer have to refresh page to view changes. iOS: Folders are displayed in app. [5.3.1] Power Users no longer encounter speed-related system performance issues.